Complete the luxurious look of your bedroom with this set of two Amberly quilted European shams from Laura Ashley. 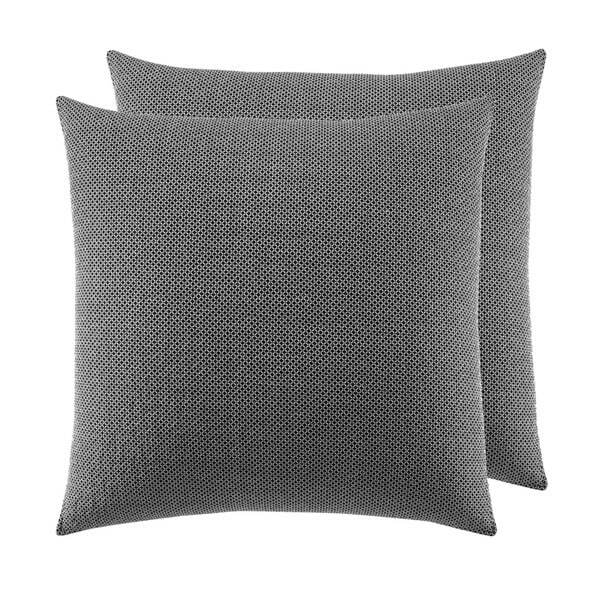 The shams are crafted from 100-percent cotton with an intriguing and intense black and white geometric check pattern. The front of each sham is quilted and the sturdy zippered closure is hidden, creating a clean, modern design that is perfect for your home. It does look lovely with the Laura Ashley Amberley 3 piece quilt set. I love this black and white geometric pattern it goes with almost anything. I put it with a grey and cream southwestern pattern coverlet and it is a nice accent with that as well. There is a well concealed zipper closure and I love the quilted pattern. Washes well and it's a set of two. Great deal. These shams are excellent quality with an easy zipper closure. The pattern is complimentary to the Laura Ashley quilt. They are quilt on one side too. Very well made Laura Ashley Amberley Black and White shams purchased to go with the bedding set for a college dorm room. Has held up well, even after several washings. Would purchase these shams again in the future. Same as quilt. Good quality and I love the color. Photos do not do these sham covers justice. They are well made with an intricate embroidery design that make them look very high end. Size is perfect and comes with zippers that make them easy to remove and wash. Highly recommend! We chose this collection for one of our guest rooms and it's lovely!. Recommend if you're looking for a black and white themed print for any bedroom. These pillows add a nice touch to the Laura Ashley Quilt set. These are very good quality euro shams. More of a black and white print, than gray. Not exactly as pictured. But, nice. These go great with the comforter set. Nice and big. Exactly as pictured - lovely! Easy ordering, fast shipping, quality product .... you can't ask for more than that! Very pretty shams - I used them to cover pillows I'm using on the family room sectional. Works well with quilt set. Beautiful addition to the quilt set! "Do these come with the pillows inside the shams, or are the pillows themselves sold separately?" These are shams only, the pillows are not included.